The global access to electricity stands at 87%, with access to mobile devices at 97% (subscriptions per 100 people). However, the inequity of access needs attention. For example, while some countries have over 100% on mobile device accessibility, as in Finland (229%), others like Niger and numerous island states have less than 50% on the same indicator. Similarly, the disparity and inequity are stark for electrification. Nearly 1.3 billion people worldwide, or 19% of the global population, lacked electricity in 2010. The access to reliable sources of energy can greatly impact education, health, social and economic development. In addition to regional disparity, global data show how the glaring digital divide prevents women from accessing financial tools or new markets. Women are 36% less likely than men to own mobile money accounts, while 114 million fewer women own a mobile phone, and women are less likely to use their mobile phones or access Internet than men. One most obvious way to ensure economic wellbeing to improve lives is through employment, which can lift families out of poverty—unfortunately, the World Bank statistics show that the global employment rates have been slowly declining from 1991 (61.8%) to 2016 (58.5%). This landscape on electrification, connectivity, gender disparity and employment highlights severe inequities, but also presents a huge potential to tailor initiatives that bring together electrification via sustainable and renewable energy as a means to improve lives in marginalized areas—especially for women—for holistic growth and development. Targeted skills training may help improve employment outcomes for women. Photo courtesy the Center for Sustainable Development. Taking all these factors into consideration, i4SD and the Center for Sustainable Development’s Connect To Learn teams have been envisioning concrete ways to provide income-generating skills for women through targeted skills training with the use of sustainable and renewable energy. The result is a comprehensive “ICT Center” model for Information and Communication Technology (ICT) for women’s entrepreneurship and empowerment in India, proposed for Telangana state. The center brings a unique combination of sectors such as energy, education, gender to meet the United Nations’ Sustainable Development Goals. Currently, the inclusion of women in cyber café businesses in India faces several challenges. First, there are social and family restrictions stemming from gender discrimination and the burden of household tasks. Further, these businesses usually offer unfavorable environments for women, as they are frequented by male crowds without female attendants. Finally, cyber cafés have poor infrastructure due to slow power and Internet connectivity, thus showing the need for a renewable energy-powered model. 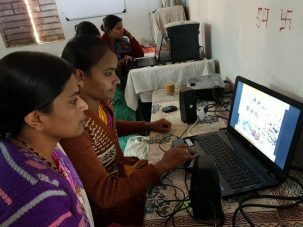 Portions of the proposed ICT Center model have already been tested: smaller pilots of technical skills training classes for women have been helping mostly illiterate women in urban slums in Bhopal to use English and computers to improve their artisan crafts, as well as to help broaden their market and product research for their business. 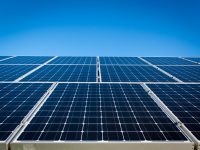 Pilots have also been conducted with solar mini-grids with storage, providing a cleaner and more sustainable solution than fossil fuel-based systems for powering off-grid facilities. This system can also provide consistency and security in places with unreliable grid connections, therefore making it one of the best choices of technology to power the proposed ICT Centers. Skills training offered through the ICT Center will be key to various employment opportunities linked to energy business, business administration, teaching, trade, tourism and entertainment industries—prioritizing opening more opportunities for women. The program model for the education component will follow a Training-of-Trainers model. The focus of the center programs is to build cohorts of knowledgeable individuals who are not simply acquiring skills, but also acquiring skills and competencies to train and mentor others. While cross-sectoral approach has been a key phrase in development, few initiatives have demonstrated a fully comprehensive approach designed to simultaneously reduce inequalities by addressing job market-aligned education needs, for women, for economic growth, with affordable and clean energy. This model gives us a chance to implement multiple Sustainable Development Goals under one roof. i4SD (Infrastructure for Sustainable Development) is a social impact design firm that uses innovation to change the way infrastructure systems are designed and operated. Their mission is to enable universal access to affordable and modern infrastructure services: Energy, Water, Transport & Connectivity. i4SD brings together traditional master planning, IoT technologies and public-private partnerships to deliver sustainable infrastructure projects providing access to essential services in traditionally undeserved areas. Center for Sustainable Development (CSD) is positioned at the heart of the Earth Institute at Columbia University, whose research and innovative solutions support governments and organizations around the world to achieve the Sustainable Development Goals. The education arm of the Center, Connect To Learn, is an initiative of CSD, Ericsson and Millennium Promise, whose mission is to address the lack of universal access to quality education, with an emphasis on the marginalized – especially girls – in resource poor settings globally. A version of this article was originally published May 3, 2018, on the Center for Sustainable Development blog.